Grace's world is one full of dust. In fact she feels as if she is spending half her life cleaning her home with her mother. The dust is in everything and on everything, carried across the prairie by an almost constant wind. Then there are the times when "dusters" hit, when the sky is blotted out and it becomes as dark as night. Dust gets everywhere and Grace's family have to wrap wet cloths around their faces so that they can breath. Combined with the drought, the drifting sand has made the land around Grace's home very hard to farm. The wind blows down the crops and the drought dries them up. Despite these hardships Grace and her family have survived quite well. Then the dusters become more and more frequent, friends and neighbours start to leave for California where they hope to find a better life, and more and more people begin to get sick with "dust pneumonia." When Grace's best friend Helen leaves, Grace is hard put to bare the loss. Helen has always been there for Grace in good times and bad and to be without her friendship is terrible. 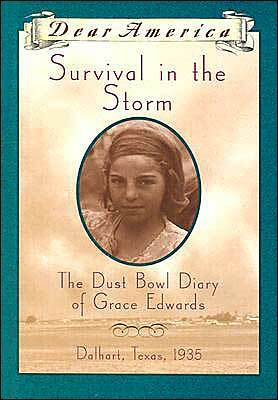 One hardship after another hits the struggling farming community and Grace worries that soon her family too will have to leave their home in Dalhart, Texas, to find work. Her father's crops are much smaller than usual and they all wonder if the family will be able to survive on the little money the crop brings in. Will they too get "dust pneumonia" and end up in the hospital, and will the dust and sand destroy their home and their livelihood? This unique book is uplifting and full of the spirit of those who stayed and fought the dusters, the drought, the illness, and many other hardships. By standing together as a community and helping one another Grace's family and others keep on going despite all the losses that they incur. This is Katelan Janke's first book, which she wrote when she was just fifteen years old.